Your iPhone makes no sound even though, when you press the volume buttons, you see the word ‘headphones‘ above the volume slider. You’re absolutely convinced that there are no headphones plugged into your iPhone and tried everything you can? Including restarting or plugging the headphones in and out again and again, but still not working. 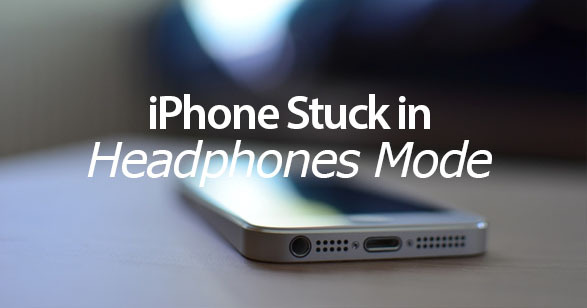 In this article I will try, to the best of my ability, to explain why your iPhone may be stuck in headphone mode; also some great little tricks for getting junk out from headphone jack, and how you can finally fix the problem – permanently. The reason your iPhone is stuck on headphone mode is because it thinks the headphone jack has headphones plugged into it, even though it doesn’t. Generally, this problem’s caused by the headphone jack itself. Almost 100% of the time this is not a software problem – it’s a hardware problem. It’s very easy to determine if a software problem is causing your iPhone to stay stuck in headphone mode – simply turn it off, then back on again. Press and hold the Power (Sleep/Wake) button until the red slider appears. Drag the slider “Slide to Power Off” to turn your iPhone completely off (can take up to 20 seconds or even more). After the device turns off, press and hold the Sleep/Wake button again until you see the Apple logo; then let go. Using a strong flashlight, shine it inside the headphone jack of your iPhone. Can you see any scrap inside? Personally, I’ve seen everything from brown goo, to rice, to the remains of cheap headphones stuck inside. It’s not easy trying to extract scrap from the headphone jack. You can easily damage your iPhone’s headphone jack by rummaging inside it, but most people seem to agree that, by this stage, you really have nothing to lose anyway. What’s the Best Way of Getting Junk Out? Obviously there’s no super formula or secret tools, and certainly you will not find any tools in the App Store for extracting scrap from headphone jacks. However, we are familiar with some unofficial tricks that Apple techs use to clear out debris. Remember, though, that these methods can cause damage, and they’re certainly not Apple-approved methods: however, I’ve had success with these methods in different situations. Remove the cap from a standard Bic pen. Pull the pen tip away from the plastic housing using a pair of pliers. You’ll see that the tip is attached to a plastic cartridge containing the ink. It’s the opposite end of the cartridge that you need, because it’s the ideal size for cleaning dust and dirt from the headphone jack. Gently insert that end into the headphone jack, then carefully twist to loosen the dirt: shake the loosened dirt out of your iPhone. Don’t be tempted to press too hard. Try blowing air directly into your iPhone’s headphone jack by using a can of compressed air. This process could work well, even if you don’t notice anything stuck inside the headphone jack. Compressed air is great for loosening dust and dirt just enough to be able to blow it out or shake it out. Be very gentle when doing this: Start from the outside of your iPhone and carefully work your way in: don’t put the hose down into the headphone jack of your iPhone and start blowing. You could try blowing it out yourself if you don’t have a can of compressed air. However, this is not a particularly good option because the moisture contained in your breath could damage the internal circuitry of your iPhone. But, if you feel at this point that you’re out of options, then certainly give it a try. Sometimes, by using really thin tweezers you can reach far enough inside to pull any dust or dirt out of the headphone jack of your iPhone. It is risky, though, to use tweezers. If you push the tweezers in too far you risk damaging the sides of the headphone jack. One of our solutions is simply to restart your iPhone because in many situations it does work. Press then hold the Sleep/Wake button: when you see the red slider, drag it and turn off your iPhone. To turn on your iPhone, simply press the same button the same way. Still Can’t Get My iPhone Out Of “Headphone” Mode! Your iPhone probably needs to be repaired if you’ve tried everything mentioned above and it still isn’t working. There are one of two reasons why headphone jacks and iPhones stop working. This is a very common problem with iPhone’s: they can get stuck in headphone mode through water damage, and most of the time the user has no idea how this occurred. Many times this problem is caused by sweat running down the cord of an athlete’s headphone. Without the user realizing it, the iPhone gets stuck in headphone mode because a small amount of sweat is caught inside the headphone jack.